Dramatic skies, migration starting...what an exciting day at the fort. come back to life and the early arrivals are indeed welcome at last. there were 2. There will soon be many. to the northeast during that time. of BLACK SCOTERS (total of 75) and a group of 15 GREATER SCAUP. Fishermen, environmentalists, anglers, representatives from the Passamaquoddy tribal government, federal agencies and the Canadian government have spoken: Alewives should be allowed to return to their native St. Croix river. At a legislative hearing Monday, speaker after speaker rose in support of a bill, L.D. 72, that would immediately open many fishways at the river's dams to Alewives. Our own Sean Mahoney, EVP & Director, CLF ME, testified in support of the bill, arguing, "L.D. 72 is simple, it does the right thing and its benefits – to the watershed, the ecosystem and the many whose livelihoods would be enhanced by a return of the alewives – would be relatively immediate." The legislature is currently considering three bills, and Mahoney was joined by the vast majority in supporting L.D. 72, an emergency bill sponsored by Passamaquoddy tribal Rep. Madonnah Soctomah, that would require the Grand Falls Dam fishway to be opened to the "unconstrained passage" of Alewives by May 1st, before the species' spring spawning season. The opening would give the fish immediate access to over 24,000 acres of habitat, compared to a sparse 1,174 open today. In all likelihood, this opening would lead to Canada's opening the fishway upstream at the Vanceboro dam, allowing access to thousands of additional acres. One researcher estimated that if spawning runs had access to the entire watershed, alewives could number more than 20 million, up from just over 31,000 now. The alternative Adaptive Management Plan, L.D. 584, calls for a more gradual, staged reintroduction of spawning Alewives to the river. Proposed by Governor Page's administration, this plan met overwhelming opposition at Monday's hearing, and was even condemned by one of its own co-authors. It falls far short of restoring alewives throughout the watershed. It also would run afoul of federal law concerning the operating of dams such as the Vanceboro Dam, as well as the State's own water quality standards, as noted by Sean in his testimony. The LePage administration, along with fishing guides from Washington county, were alone in their concerns that reintroduction of Alewives may lead to a decline in smallmouth bass. The National Marine Fisheries Service and the U.S. Fish and Wildlife Service asserted that smallmouth bass, which were introduced into the St. Croix in 1877, have lived harmoniously with spawning Alewives in hundreds of Maine's lakes and rivers. Mahoney's testimony, which you can read here, provides the legal arguments against L.D. 584. You can more about our work restoring the alewives to Maine's rivers here, or check out our latest blog posts about alewives here. A Lesson in Signage for the Province of New Brunswick ... "The Drive-through Province." NOW THIS SHOULD GIVE THEM FITS IN TOURISM NEW BRUNSWICK OR WHOEVER IS RESPONSIBLE FOR SINKING OUR ROAD-SIDE BUSINESSES. Billboard ads are very special type of advertisements because they are designed to target viewers who are driving or walking in the streets, heading to work, or school. The name ‘billboard’ refers to the large outdoor advertising board that you can find next to roads, sidewalks, and on the walls of buildings. Billboard ads use different methods to visualize their ideas, such as a large poster, an animated digital signage, or a mixture of different objects and materials based on the creative concept of the given ad. The main target audience for billboard ads is busy drivers and passers-by who rush to their jobs, schools, or homes. Most of them do not care much about the ordinary advertisements around them, which is why billboard advertising ideas are designed to have some special characteristics. Based on their target audience, a number of aspects need to be considered in order to create a successful billboard ad campaign. Attract your audience. As I have mentioned earlier, the audiences of billboard ads are usually in a rush, either driving on the highway or walking in the street. Therefore, billboard advertising ideas should be very creative and attractive to direct the viewer’s attention to the message that the ad campaign wants to deliver. The large and big rule. Billboard ads are usually put on buildings or high stands to be viewable for drivers from a long distance. Thus, the ad’s design should be large and the elements should be big enough for everyone to see from afar. Simple and clear. Subsequent to the large and big rule of the preview, the design should be simple and reflective. Make sure that the design does not have crowded elements that may confuse the viewers. For example, the text should be limited to only a few words with a large font, as the viewer will not be able to read long paragraphs. Keep it targeted and direct. The messages of billboard ads should be targeted, short and clear. Audiences will not have much time to think about the idea and the complex meaning behind it. March 22 is World Water Day, and to mark this day, the Council of Canadians encourages you to take action for water in your community. There are few things more important than clean, safe water, but new federal government legislation, damaging and polluting industries, and water privatization efforts are putting our water sources at risk. You can make a difference. The fight to reclaim water as a commons – a public resource available to all – is happening now. Across Canada people are objecting to omnibus budget bills that removed much-needed protections from 99 per cent of lakes and rivers in Canada, they are fighting plans to cut environmental assessments for massive projects such as pipelines that endanger waterways, and they are standing up for public water in their communities. 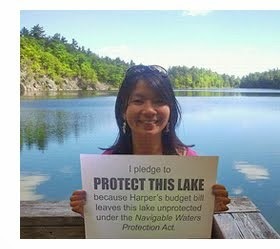 Join our photo campaign to send a message to the Harper government that we will protect our water sources even if it won't. Make your community a Blue Community by getting your municipal council to recognize water as a human right, support public water and ban bottled water. Pass a fracking resolution in your community and help stop this extraction technique that uses and pollutes millions of litres of water. World Water Day events are happening across Canada. Thirty-five communities will be holding 44 events, and more are being added every day. Be sure to check out the events being organized in your community and don't forget to check out our resources and publications that you can use to help inform people and raise awareness. Join us on March 22 so we can all make a difference for water! Gulf of Maine Fish Talk in the News – Any such discussions in the Bay of Fundy? The shrimp season in the Gulf of Maine has been very unsuccessful, with a meager catch preventing fishermen from reaching even their small quota, which was cut by 74 percent from the previous season’s levels. In response, regulators are now allowing shrimp boats to fish seven days a week, up from two at the beginning of the season, and have eliminated the 800-pound trip limit. The limited supply has pushed prices several dollars per pound higher. Meanwhile, Sky 8 shrimp farm in Stoughton is preparing for its first harvest of farmed Pacific white shrimp and already has plans to expand. Five species of critically endangered sharks have been granted additional protection at the Citesmeeting held this week in Bangkok. The oceanic whitetip, three species of hammerhead, and the porbeagle are all at risk from fishing for their fins. Cites voted to upgrade these species to Appendix 2, which regulates their trade by requiring licenses for exports and imports and introducing sanctions for excessive harvests. Scientists and conservationists lauded the decision as a historic moment for shark conservation. The measures also cover two species of manta rays. Hearings on the Magnuson-Stevens Act began this week in anticipation of the 2016 deadline for reauthorization of the fisheries conservation legislation. The hearing on Wednesday featured witnesses including John Pappalardo, the CEO of the Cape Cod Commercial Hook Fishermen’s Association, and Sam Rauch, a Deputy Assistant Administrator for the National Marine Fisheries Service. In New England,the debate has been characterized by the difference in opinion between Congressman Ed Markey, who believes the rebuilding requirements in the act already have enough flexibility, and Congressman John Tierney, who has advocated for more lenient deadlines for rebuilding depleted stocks. Pushes for improvements to fisheries science are also expected. Concurrent with the first hearing, the Natural Resources Defense Council released a report indicating that 64% of once overfished stocks have made significant progress under the act, with revenues increasing 92% ($585 million) for rebuilt stocks. The report noted mixed progress for New England’s groundfish species. Scientists are concerned over rapid warming and ocean acidification in the Gulf of Maine, according to an article published in the Portland Press-Herald this week. Measurements indicate that coastal waters may be acidifying at a rate three times faster than the open ocean. The process has the potential to harm shellfish and fish larvae and reduce populations of plankton that form the basis of the food chain for all marine species, and warmer waters could contribute to lower oxygen concentrations that would create inhospitable conditions for many animals. Warmer waters are also linked to shell disease that decimated lobster fisheries in southern New England in the 1980s. The Marine Stewardship Council has granted certification to the Maine lobster fishery, according to an announcement by Governor Paul LePage on Sunday at the Boston Seafood Show. Maine lobsters can now be sold bearing the MSC ecolabel, a seal intended to inform consumers that their seafood was harvested in a sustainable manner. An end-to-end review of New England groundfish stock assessments will be conducted by the School of Marine Science and Technology at UMass Dartmouth. Congressman Bill Keating pushed for the review, which will examine how to incorporate environmental changes into the stock assessment process, how surveys and monitoring are conducted, and how overfishing and catch limits are determined. The review will include four workshops held over a period of several months. UConn environmental history professor and New England Fishery Management Council member Matthew McKenzie recounted December 20th, when the Council decided to dramatically cut cod catch limits in response to dire stock assessments. He noted that nearly all parties were in agreement about the utter lack of fish, commented on the long history of decline in New England’s cod stocks, and acknowledged the difficulty of simultaneously managing the full suite of groundfish species. Although there has been some wiggle room in regulations for the last 30 years, he said, that opportunity has now passed and difficult decisions are unavoidable. The groundfish committee of the New England Fishery Management Council met on Wednesday to resume discussion of Amendment 18, a suite of measures to reduce consolidation and protect fleet diversity in the New England groundfish fleet. The measures will likely include caps on quota accumulation, and the committee will begin by refining a set of goals voted on in 2010 before introducing them to the Council next month.